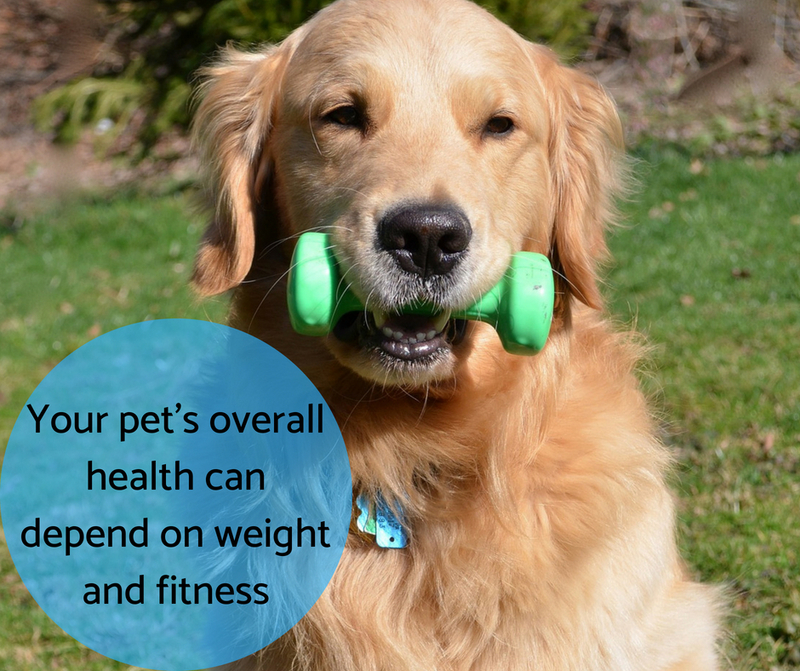 Weight loss can help improve the quality of your pet’s life in a number of ways. It can decrease the stress on joints (especially important for pets with arthritis), help facilitate examination and surgical procedures, improve cardiovascular function, enhance athleticism, and reduce or eliminate the need for certain medications required to manage medical disorders. In addition, a recent study has shown that dogs who maintained their ideal body weight for life lived almost two years longer than moderately obese dogs. Plus, they will feel much better! In humans, published charts such as the Body Mass Index are helpful in determining the ideal weight for a specific body size. Since our pets vary dramatically in body size and shape, however, these charts are not as useful in veterinary medicine. 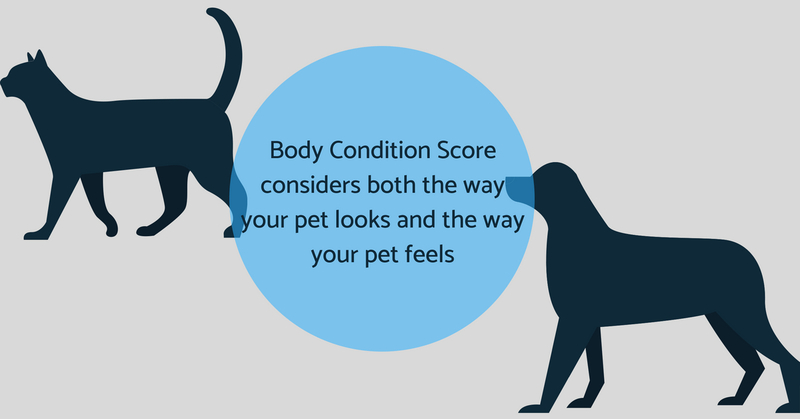 Instead, veterinarians visually grade pets using a Body Condition Score (BCS). The BCS is a somewhat subjective rating used to standardize the level of an animal’s weight. This helps us formulate a diet and exercise plan that best suits your pet’s body, activity level, and lifestyle. BCS scales typically range from 1-5 or 1-9. 1 is the lower weight end, and 5 or 9 is for the higher range of the weight spectrum. Generally, either 3 or 5 is considered "ideal." It is important to evaluate your pet’s silhouette from above and from the side. The key structures to look at include the ribs, spine, hip bones, waist, abdomen, muscle mass, and overall fat covering. At a healthy weight, you should be able to see your pet’s waistline (an hourglass figure) from above. From the side, your pet’s abdomen should appear tucked up behind the rib cage. It is also important to feel your pet to evaluate his/her weight. You can feel your pet’s ribs by placing your thumbs on his/her backbone and spreading both hands across the rib cage. Ideally, you should be able to feel each rib under a thin layer of fat. 1/9: Emaciated - Ribs, spine and hip bones are visible from a distance. No discernible body fat and an obvious loss of muscle mass. 2/9: Very thin - Ribs, spine and hip bones are easily visible. No palpable body fat and minimal loss of muscle mass. 3/9: Thin - Ribs can be easily felt and may be visible with no palpable fat. Top of the spine is visible and hip bones may also be prominent. 4/9: Underweight - Ribs can be easily felt with minimal fat covering. Waist is easily noted when viewed from above. An “abdominal tuck” is also present, meaning that the abdomen appears tucked up behind the rib cage when viewed from the side. 5/9: Ideal - Well-proportioned. Ribs can be easily felt without excess fat covering. Waist can be observed behind the ribs when viewed from above. Abdominal tuck is present. 6/9: Overweight - Ribs can be felt through a slight excess fat covering. Waist is visible from above, but not prominent. Abdominal tuck is present. 7/9: Heavy - Ribs are difficult to feel under a heavy fat covering. Noticeable fat deposits over the lower back and base of the tail. Waistline is absent or barely visible and abdomen may appear obviously rounded or saggy. 8/9: Obese - Ribs can only be felt with heavy pressure. Significant fat deposits over the lower back and base of the tail. Waist and abdominal tuck are both absent. Obvious abdominal distention may also be present. 9/9: Severely obese - Ribs cannot be felt under a very heavy fat covering. Large fat deposits are seen over the neck, chest, spine, and base of the tail. Waist and abdominal tuck are both absent. Obvious abdominal distention and a broad, flat back may also be present. If you have any concerns about your dog or cat's weight and nutritional needs, be sure to contact us!